More than 200 interest groups – including corporations, foreign governments and various political associations -- have spent money at Trump properties, most notably the Trump International Hotel Washington D.C., since Donald Trump was elected president in 2016, according to a government watchdog group. Analyzing social media posts, press reports and campaign records, including financial documents filed with the Federal Election Commission and Foreign Agent Registration Act forms filed with the Department of Justice, Public Citizen identified 121 political candidates or groups; 47 businesses or business groups; 12 religious groups; 10 foreign governments or groups representing their business interests; eight charities; four state and local governments; and two educational institutions that chose Trump properties for trade shows, fundraisers, parties or other events, raising a host of questions about potential conflicts of interest and pay-to-play politics. Ethics experts say the patronization of the president's businesses – from which he has opted not to fully divest– by private interest groups, corporations, political groups, and foreign governments is a troubling trend observed since Trump took public office. 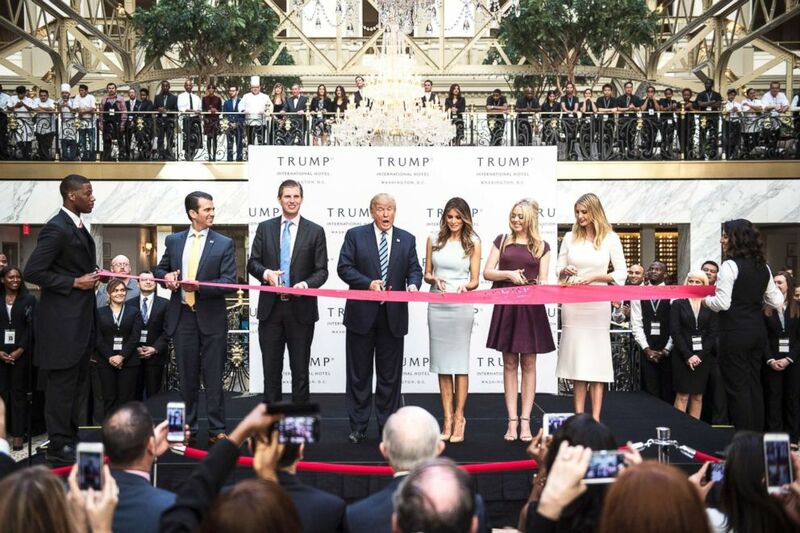 In this file photo, Donald Trump, accompanied by Donald Trump Jr., Eric Trump, Tiffany Trump, Melania Trump and Ivanka Trump, cut a ribbon during the grand opening ceremony of the Trump International Hotel in Washington, D.C., Oct. 26, 2016. Following his election, Trump answered demands that he divest from his family businesses by placing his business empire in the control of his three adult children via a “blind trust” and pledging to donate any foreign earnings to the US Treasury. In February, the Trump Organization announced it had made its first such donation. George Sorial, the Trump Organization’s chief compliance officer, said in a statement at the time that the company had passed along the income its hotels, golf course, and other businesses have received from foreign sources in 2017. ABC News has since learned that the Trump Organization made out a check for $151,470 to the US Treasury. A review of the data, obtained by ABC News, shows that several groups associated with foreign entities, including Cyprus, the Philippines and Vietnam, have held events at Trump International Hotel Washington D.C. in recent weeks. The amount spent by those groups – and others who have recently held events at Trump properties – remains largely undisclosed because the expenditures are too recent to appear on FEC or other filings. PSEKA did not immediately respond to a request for comment. Earlier this month, the Embassy of the Republic of the Philippines also hosted a reception celebrating the 120th anniversary of Philippine independence at Trump’s Washington D.C. hotel. The event happened to coincide with the Philippines seeking a new U.S. trade deal, which Trump has indicated he will consider, but no decision has yet been made. In response to request for comment, the Embassy of the Republic of the Philippines referred ABC News to a pair op-eds published by Ambassador Jose Manuel G. Romualdez in The Philippine Star, touting the success of the event. 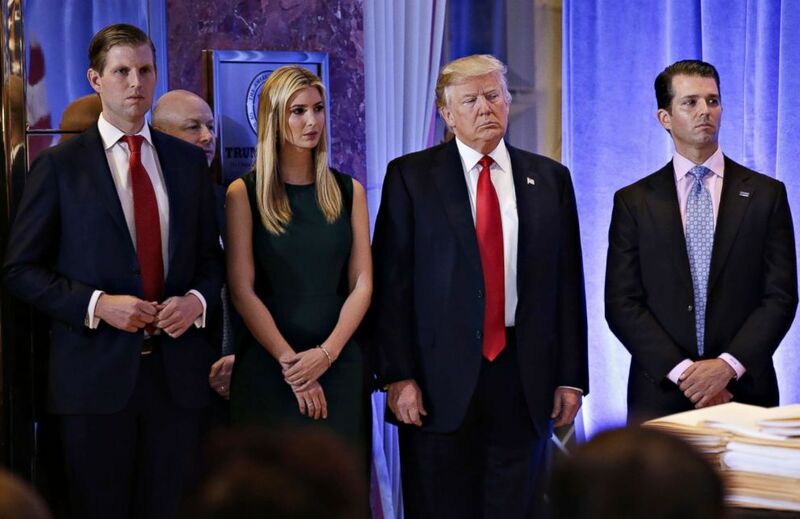 President-elect Donald Trump stands with, from left, Eric Trump, Ivanka Trump and Donald Trump Jr. before he speaks at a press conference at Trump Tower on Jan. 11, 2017, in New York City. And on Monday, a Vietnamese company engaged primarily in the development of resort real estate called FLC Group held its first-ever Washington D.C. investment roadshow at the Trump hotel. According to an English translation of FLC Group’s press release, the “Vietnam: Investment Potential & Opportunities” seminar was expected to attract leaders from representatives of diplomatic missions, investment fund, management companies, financial institutions and potential private investors. FLC Group did not immediately respond to a request for comment. Several pro-Trump political groups also appear to have gravitated toward Trump International Hotel Washington D.C., which opened shortly before Trump’s election in October 2016. In May, the pro-Trump group MAGA Coalition Inc. held an event at Trump’s D.C. hotel headlined by Sarah Palin, the former governor of Alaska, and Diamond & Silk, the Trump-supporting social media stars. In the invitation for “An evening with Governor Sarah Palin and special guests Diamond and Silk” obtained by ABC News, the cost of admission to a VIP reception was $2,500, while tickets to the regular reception and Q&A cost $500 for preferred seating, and $250 for general seating. MAGA Coalition did not immediately respond to a request for comment. The pro-Trump Super PAC America First Action, Inc. appears most frequently on the list of Trump property patrons. Last week, the PAC held a two-day leadership conference at the Trump’s D.C. hotel, where donors paid $100,000 for a general ticket, and $250,000 for a VIP ticket, according to a spokesperson for the PAC. On the opening night of the conference, former White House Press Secretary Sean Spicer, who recently signed on as the group’s senior advisor and spokesman, delivered remarks and introduced special guest Mike Huckabee, the former Arkansas governor and presidential candidate whose daughter, Sarah Huckabee Sanders, replaced Spicer as press secretary. President Donald Trump delivered the keynote remarks the following night, and ABC News also spotted Donald Trump Jr. in and other beltway politicos, like Rep. Jim Jordan, a Republican from Ohio, in the crowd. The money collected by both groups will be put towards supporting efforts to re-elect the president, as well as supporting Trump-aligned candidates for political office. For Alan Zibel, research director of Public Citizen’s Corporate Presidency project, the spending makes it difficult to separate Trump’s private and public interests.